Operating on the high-frequency (HF) ham radio bands can be very exciting as conditions change around the world. To help you be in the right place at the right time, propagation prediction programs are available. Many are free, such as the HamCap software from Alex Shovkoplyas (VE3NEA). 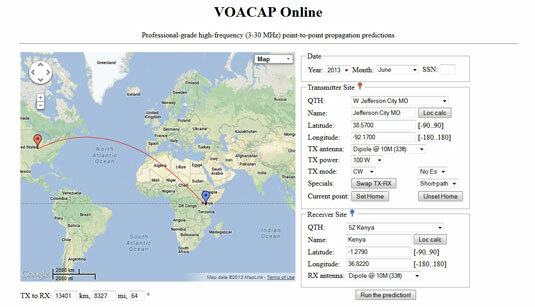 The online prediction service VOACAP Online is easy to use and helps you understand propagation. 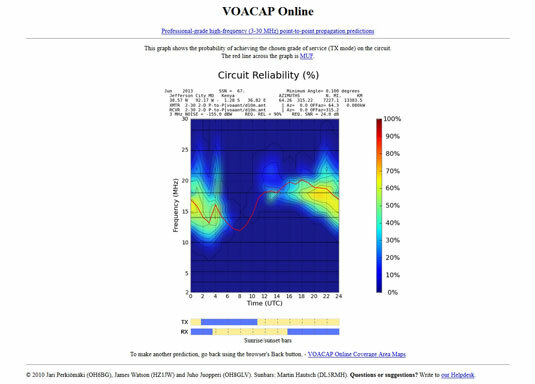 Both programs use VOACAP, the underlying engine that does all the calculation based on current solar information. You can have a lot of fun with propagation prediction programs, but remember: they aren’t exact; conditions can change from day to day and hour to hour; and while you’re on the computer, you’re not on the air making contacts! 1Make sure that the month and year are correct. Don’t enter a value for SSN (Smoothed Sunspot Number), because the program will obtain it from an online source. 2Select a transmitting location from the Transmitter Site section’s QTH menu (typically, your home location). When you make a selection, the red map pin moves to that location. 3Select a receiving location from the Receiver Site section’s QTH menu. The distance and bearing information below the map updates, and the blue pin moves to the receiving location. 4Leave all antenna, power, mode, and other information alone for now. The screen looks like the one shown here with a map on the left and the leend information on the right. 5Click the button labeled Run the Prediction! Each of the HF amateur bands is marked as a black line across the graph with increasing frequency along the vertical axis. Universal Coordinated Time (UTC) is shown along the horizontal axis. The color bar on the right shows the probability that your transmitted signal will be heard at the receiving site. Sunrise and sunset at each location are shown below the graph. In this particular scenario, there’s a pretty good chance of being heard in Kenya from central Missouri on the 17 meter band between 1800 and 2400 UTC, followed by a 4-hour potential opening on the 20 meter band.